A trainwreck. The worst campaign setting I've read for PFRPG. This campaign setting clocks in at 145 pages, 1 page front cover, 2 pages of ToC, 1/2 a page editorial, 1 page SRD, 1 page advertisement, leaving us with 139.5 pages of content, so let’s take a look! This would be a campaign-setting, and a peculiar one – after the failed KS, I did not expect to see this, but Rogue Genius Games seems to have salvaged it – NICE! So what is this about? Well, the basics, as the astute reader can glean from the introduction in in-character prose (the last half column of which oddly isn’t italicized), would be that this is a post-apocalyptic setting in our world…one with “gothic horror” spliced in. Worse, it’s also thematically broken – or at least, advertised falsely. 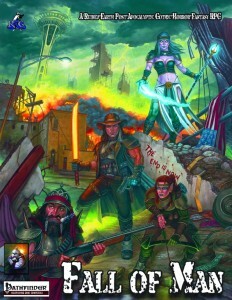 If I had to sum this up in one sentence, it would be: “Amethyst Renaissance, but not as smart, concise, well-presented, compelling or diverse.” And yes, I am aware that Amethyst’s PFRPG-conversion very much is influenced by its 4th edition version – I still consider it to be vastly superior. Fall of Man tries to be post-apocalyptic, but alas, in that component, Sneak Attack Press’ Broken Earth mops the floor so hard with it, it’s not even funny anymore. It is billed as “Gothic Horror” and I have NO IDEA WHY. This has NOTHING. NOTHING. NOTHING AT ALL to do with gothic horror. Psychology? Monsters representing repressed desires? Labyrinthine buildings as metaphors for the psyche? Nope. The only analogue I could find was Castle of Otranto plus Satan’s Maul – and that one is VERY thin and stretched. If you’re curious about this train-wreck, you can purchase it here on OBS and here on d20pfsrd.com’s shop. I warned you.